A bright copy in original cloth of Captain Conder’s substantial record of his explorations in Syria between 1881 and 1882, published for the Palestine Exploration Fund. Conder began his expedition in North Syria, before travelling to Kadesh and Jordan, and his work includes chapters on Mount Gilead, Ammon, and the Belka Arabs, as well as Syrian superstitions and Arab folk lore, together with a detailed appendix. Illustrated with four full page engraved plates, and a sketch map of Syria. 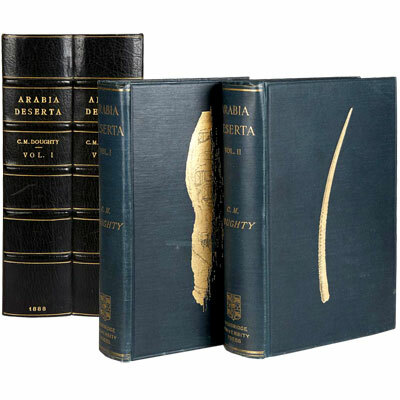 A superb and thus scarce two volume first edition of what Howgego describes as ‘one of the great classics of travel literature’, an ‘unrivalled encyclopaedia of knowledge about all aspects of nineteenth-century and earlier Arabia.’ (Oxford DNB). Profusely illustrated throughout with plates (many folding), sketches, maps and diagrams, together with large and magnificent folding colour ‘Sketch Map of Itinerarium of part of North Western Arabia and Negd’ in pocket at rear of volume 1. Housed in a bespoke matching green morocco and cloth clamshell case by Sangorski & Sutcliffe, spine lettered in gilt, enclosing two separate green cloth chemise. A substantial part of Eyre’s narratives where written whilst actually imprisoned by the Afghans. Eyre, seriously wounded, and his family were captured by Akbar Khan and held for nine months until rescued by General Pollock’s forces. Some of the manuscript was smuggled out of his cell while he remained a captive and on its arrival in England it was published. At the time, Eyre’s account and that recounting similar experiences by Lady Florentia Sale were considered companion pieces that would enable the British public to understand the Afghan debacle, the disaster that had there befallen the army under Elphinstone and the resulting annihilation of the army in the Afghan passes as it struggled to retreat into India. Eyre provides a detailed and moving description of the misfortunes of the British forces and the indiscriminate slaughter of their retreating column by their enemies, as well as a unique account of the harrowing conditions and distressing treatment that were inflicted on the British hostages by their Afghan captors. Illustrated with folding lithographed ‘ Plan of the Cantonment and Surrounding Country’ of Cabul. The edition, published the same year as the first, includes corrections and additions by Edward Eyre not found in earlier issues, including an Appendix with copies of various previously unpublished dispatches. From the library of Colonel Reynolds (1863-1931), the Royal Inniskilling Fusiliers, a regiment that over time has been amalgamated into the Royal Irish Regiment, and who, despite the disastrous military campaign of 1841-2, were deployed to Afghanistan 150 years later, serving with distinction. A near fine first edition of this history of the Afghans, their racial origins, customs, religion, literature together with a history of Christian missionary work inside the country. Includes a chapter entitled Persian Influences on the Afghans: Sufism, which the author singles out as the only cultural influence of Iran on the Afghans. Claud Field was a Christian missionary, first appointed to Peshawar in 1892. 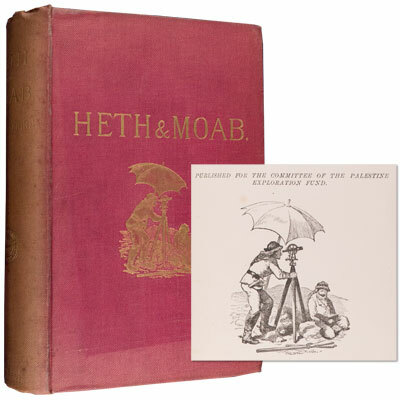 Illustrated with frontispiece, a map, and fifteen photographic plates. The fourth packet of Flashman papers, regaling us with further episodes in the life of Harry Flashman, the caddish bully of Tom Brown's School days who was expelled in drunken disgrace from Rugby school in the late 1830's. As with his previous adventures, Flashman at the Charge is rich in those qualities which one him honour and fame in his own time and have endeared him to hosts of loyal admirer since - cowardice, treachery, lechery and an unfailing instinct for survival, coupled with his own caustic humour and unsparing honesty as a historian. Scarce in both first and second edition, especially in the original cloth. Illustrated with large folding map to rear, and tinted lithographic frontispiece of the Battle of Mazeera and four lithographic plates showing the Fort of Jamrod in the valley of Peshawar, Fort Ali Musjid in the Khyber Pass, Bala Hissar at Cabul, City and valley of Cabul. ‘Here is a volume which must at once take its place beside those of Lady Sale and Lieut. Eyre, to which it forms a natural and necessary sequel... It narrates in the words and with the appliances of en eye-witness, the details, both personal and professional, of that glorious but terrible "measure of revenge," which it was the lot of General Pollock and his gallant band to inflict on the assassins of Cabool. The tale is infinitely better for being a "plain unvarnished" one... A considerable amount of amusement, as well as of utility, is added to this volume by the writer having made it the medium for his recollection of seven years' service in India, previously to the stirring events which give the chief attraction to the work. These recollections touch upon all the usual features of Anglo-Indian life, and are written in the same natural and easy vein which mark the more important portion of the narrative’ – Coburn’s New Monthly Magazine 1844. Striking copy of this comprehensive description of Egypt intwo parts, the first compiled from various well known works, and illustrated throughout with colour and tinted lithographs, and black and white in-text sketches and drawings. Uncommon in original publisher’s gilt illustrated cloth, without restoration or rebinding. The second part titled ‘Journal of a Voyage up the Nile, made between November, 1848, and April, 1849’ is an entertaining travelogue commonly attributed to John Lloyd Stephens, the renowned American archaeologist, famed for his exploration of the Maya runs in Central America, and an acquaintance Hawks met in London. A rare and important work. Illustrated with nineteen portraits printed on India paper. 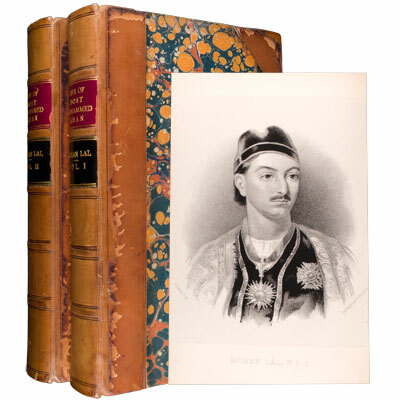 In this two-volume biography, Indian diplomat and author Mohan Lal (1812–77) describes the life of Amir Dost Mohammed Khan (1793–1863), the ruler of Afghanistan. The work also includes an eye-witness account of the disastrous First Anglo-Afghan War.